I was called to preach at the tender age of 15, spoke at youth events throughout my teens, provided supply for pastors up until I was ordained, and served my first church as pastor at the age of 22. I was privileged to lead six churches over a twenty-year tenure. 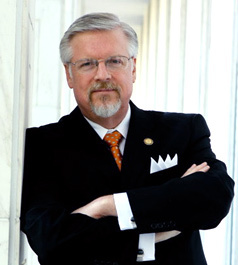 Eighteen years ago in 1999, I left the pastorate to serve as executive director of the Christian Action League, a state-wide Christian public policy organization based in Raleigh. I never aspired to be in the post I am today. In fact, during most of my pastoral ministry, I spurned political involvement. But at my last church, I became increasingly burdened about the moral melt-down occurring in America. I could see its negative impact on every valued institution of our culture. Moreover, it became clear to me that my own parishioners were in desperate need of direction on the great social issues of our day, lest they be like sheep without a shepherd, and prey for ravenous wolves. I also realized taking-up matters of political import from the pulpit was risky business for any minister who valued his job. Nevertheless, I felt constrained to do it, much like Jeremiah, the prophet who said, God's word was in his heart like a fire, a fire shut up in his bones, and he could not hold it in. Neither did I hold it in. But it was people's response that took me by surprise. What I discovered was the overwhelming majority of my congregants were craving this kind of pulpit ministry. Over time, our church started to fill up with visitors and new members. I became convinced they were searching for a relevant presentation of the Gospel of Jesus Christ and the clear terms delineated in Scripture for a virtuous life. I would be disingenuous if I led you to believe there were never any detractors. Hardly! I wasn't liked by certain people and groups and often took a great deal of heat. Yet, I must say that more than a few told me my actions had spawned a pervasive confidence and respect that there was a real man-of-God, an authentic preacher, a true prophet, so to speak, one unmoved or compromised by prevailing modern thought, in their community. This kind of obedience to God – this boldness from the pulpit, its initiation and persistence solely provided by God's grace – would eventually open doors for additional opportunities to declare the way of the Lord. The editor of the local newspaper encouraged me to write a weekly column. The next opportunity was to provide daily commentary on a local radio broadcast – a broadcast that aired on a few stations across North Carolina. Still, an additional, even larger platform of ministry would be provided by the Lord, one that came most unexpectedly. It started with a letter from the late Dr. D. James Kennedy, renowned pastor of Coral Ridge Presbyterian Church, saying he and his national organization, Reclaiming America for Christ, had been following my labors. The letter advised me that Reclaiming America for Christ wanted to highlight, at their upcoming conference in Fort Lauderdale, Florida, what they believed every pastor should be doing to reclaim our nation for Christ. Barbara Collier, who was at that that time the field director for the organization, said, "If we could get every pastor in this country to do what Mark Creech is doing, we could turn this nation around." 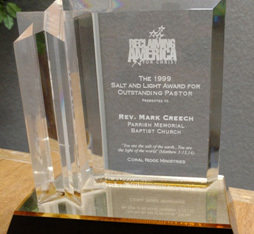 Therefore, Reclaiming America for Christ wanted to recognize my ministry by giving me their annual Salt and Light Award For Outstanding Pastor in America. The night Dr. Kennedy presented me with the award, as Providence would have it, two legislators from the North Carolina General Assembly were present, Reps. Russell Capps and Don Davis. Both men were involved with the Christian Action League. They introduced themselves, congratulated me, and expressed their pride that a North Carolinian was honored with such a prestigious award. Approximately six months later, I was approached by these same gentlemen and the president of the Christian Action League, the late Joe Lennon, asking me if I would take the helm of the League. And of course, you know the way I answered that call. I can think of no greater need at the present moment for our nation than pastors who will stand in the gap and speak faithfully to the politics of our day. There are numerous examples of God's men doing this in both the Old and New Testaments. Hebrews 11 pays tribute to many men of faith who subdued kingdoms and wrought righteousness, regardless of the personal cost. I'm sure, if you will look carefully through the annals of history, you will find most of the great reform movements that have positively impacted our moral and social structures were sparked by pulpits that unapologetically raised high God's banner for right living. It is my hope that pastors who learn my story will be encouraged to engage the culture with the Gospel and not stand aloof from politics. I don't urge pastors to do it because I did it, but perhaps they might do it because they recognize, as I did, that if clergy fail to exert moral leadership in this hour of national crisis, God will be forced to discipline his people, and destroy our civilization in order that his righteousness and justice might be upheld. Not every pastor will be summoned to enter an occupation of political activism. Nevertheless, there is a sense, I suggest, in which every pastor should be a political activist for righteousness sake.